If you live in Oregon, you are familiar with the spectacle of greenwashing at the highest levels of political theater. 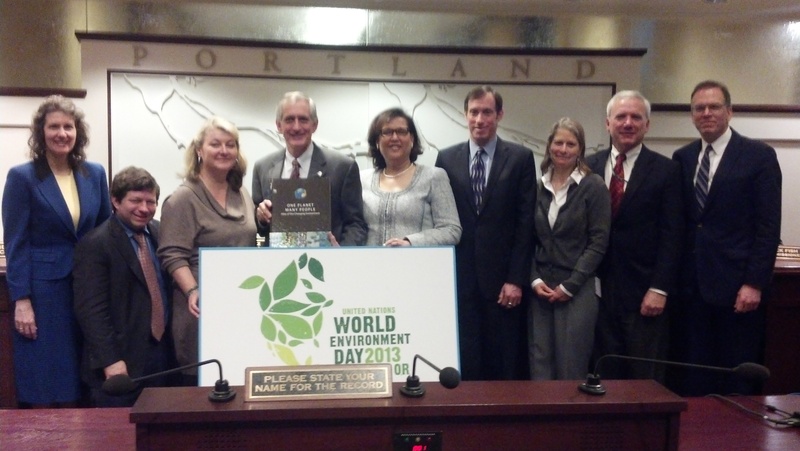 As Portland gears up to host the UN’s World Environment Day, the international attention almost obscures the plans for multiple freeway expansions, a Nestle water bottling plant, huge timber sales (whispers of biofuel replants), a dodgy LNG pipeline, and the terrible specter of coal exports. The ringleaders of the circus are the political elites. Casting new shadows on the anticipation mounting under the big top of Portlandia, inc., however, is the flight of former top aid to Senator Wyden, Josh Kardon, into the service of ExxonMobil. Kardon has made a name for himself as a premier politico around Oregon, has been at the heart of Brand Portland—the attempts to characterize as green a city fast becoming a lynchpin in the global supply chain of neoliberalism. It seems his efforts are being enlisted by Exxon to improve their own brand. There is a crucial twist. Exxon, the nation’s largest producer of natural gas and proponent of gas exports, stands in stark contrast to Wyden’s quest to stop LNG terminals in the Pacific Northwest. Wyden has opposed LNG shipments out of Oregon wholeheartedly, going so far as to attack a Department of Energy-commissioned study on LNG exports. So Kardon’s apparent flip from close “alter ego” relationship with Ron “too green for LNG” Wyden to ExxonMobil might be something to consider up close. In spite of his distaste for LNG in Oregon, Wyden has never been the green senator that he was purported to be. Back in 2003, Wyden helped pass the “Healthy Forests” initiative, a GW Bush bill that streamlined the regulatory process for timber sales in order to “thin” forests to prevent fires. On the international circuit, Wyden voted for the Peru, Panama, and South Korea free trade agreements, insisting that environmental stipulations ensuring the upholding of international treaties already in existence would somehow alter the base geographic effects of free trade. Rather than address the pervasive spread of forest clearances to stimulate economies of scale for factory farms, monocrop agriculture, and extractive industry, Wyden suggested that a few environmental protections tacked onto the end of the agreements would nudge the world closer to a greener place. This is the nature of greenwashing—altering technical facets of larger issues in order to put a “human face” on otherwise unthinkable exploitation. Concerning the same global trade agenda, Wyden has not taken a reliable position on coal shipments set to stream through the waterways, forests, towns, and cities of the Pacific Northwest. Although coal exports to China are expected to decline, and stock in coal companies has plummeted in recent weeks, Wyden still sees no tremendous problem with coal shipments and the incumbent coal ash deposits that they would bring. As of March 1, Wyden hung his locally-made, green hat on his call for a full analysis of the Keystone XL pipeline. “What is the impact on American consumers?” Wyden asks, and would it make “the United States less energy secure” or drive domestic gas prices higher? Even here, when Wyden’s agenda appears to be at its greenest, the color green is more like cash than trees. The Keystone XL pipeline remains the tip of the iceberg, a purely symbolic issue. It does not relate to the expansion of the tar sands or the $18 dollars worth of pipeline projects already approved throughout Canada and the US, let alone the massive industry moving oil shipments by rail. In fact, Goldman Sachs admits that shareholders in TransCanada would profit if the company simply abandoned the project. So, when Wyden’s top aid of 18 years goes to work with Exxon a matter of weeks after the Pegasus Pipeline disaster—arguably Exxon’s worst spill in the lower 48—it does not spread shockwaves through the environmental community. Not only does it reveal the insufficiency of the Stop KXL movement, but it also reveals the extent of greenwashing that Exxon seeks to push with the $13 million that they spend on lobbying every year. Exxon is spending their money where it matters: cleaning up their image in DC. There is an eerie convergence between Exxon, the Senate’s ENR Council, and the national budget, which is elucidated with further insight into the “low carbon economy” that everyone seems to be talking about. Last year, Exxon’s CEO Rex Tillerson declared the company is “losing our shirts” in the natural gas business. Exxon wants prices to increase, so that they can make greater profits by exporting gas. In stark disagreement stands Dow Chemical, which argues with Alcoa and Nucor that low natural gas prices help domestic industry. Exxon has already entered into billion dollar pacts with Russia’s Rosneft to exploit the Arctic and build an LNG shipping hub on the Pacific Coast. Now it wants the US to fall into line, so that the Pacific can become an ocean of cheap LNG. In this enormous debate, which bears the most serious implications for the future of the US, it makes a kind of sick sense that a partner has been found in connection to the neoliberal, pro-free trade agenda of Senator Wyden. If the only two green items on Wyden’s agenda are Keystone XL and LNG, why then is his top aid of 18 years going to the nation’s biggest natural gas producer and perpetrator of the most egregious pipeline spill in recent times? The answer has already been provided by Wyden’s free trade agenda—these two campaigns are important symbolically, but they do not necessarily indicate a larger, systematic change. In fact, powerful private and public partnerships are lining up in attempts to ensure that the motion towards enhanced corporate power and profits in the extractive industries will continue, regardless of the efficacy of these campaigns. It is this kind of cruel irony that accompanies World Environment Day, the signature UN event that greenwashed the genocidal regime of Rwanda’s President Kagame only three years ago, as it makes its way to Portland. Kardon’s movement to Exxon exposes the metastasis of Brand Portland, the struggle of power to remain on top of the floating hegemonies of popular resistance against extractive industries by greenwashing them out of sight.